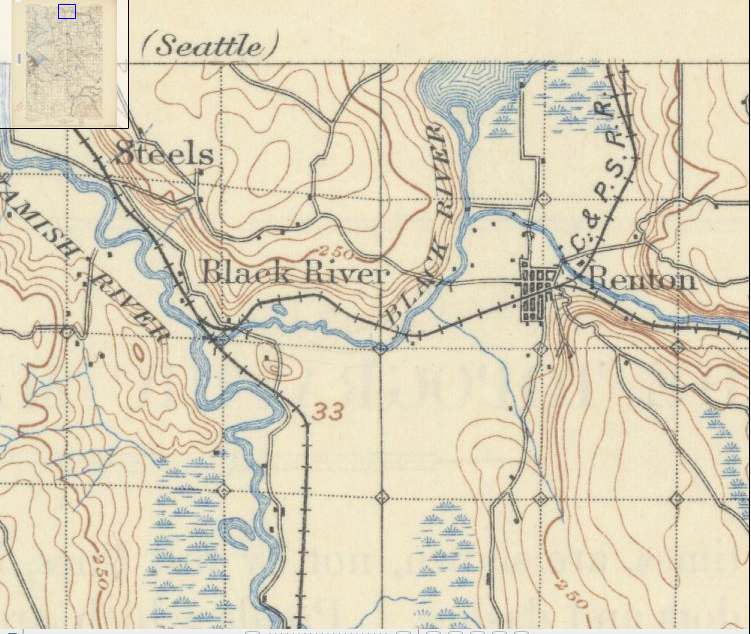 As you can see from the accompanying map, the 1909 USGS Topographic map of the Tacoma quadrangle, the Black flowed out of the lake near Renton, and was almost immediately met by the Cedar River, coming west out of the Cascade Mountains. The Black then wound around low hills, under the Columbia and Puget Sound RR, and met the Green River, where now became the Duwamish with the addition of the Black. Historically, the Green River flowed into the White River in Auburn, and the two continued as the White to the confluence with the Black. Floods in 1906, however, changed the course of the White, which now drained, and still drains, into the Puyallup River. The Green kept its course and now became the outflow for the Black, until the disappearance of the Black in 1916, which is why the Green changes name for no apparent reason and becomes the Duwamish. King County’s first sawmill outside of Seattle was at the confluence of the Black and Cedar rivers. Started in 1854 by Henry Tobin, Joseph Fanjoy, and O.M. Eaton, it had two circular saws. In order to operate the mill, the trio built a six-foot high dam. Unfortunately for the men, the mill did not last long; the Black was too windy for transport. It was not too twisted though for vessels. Soon after the discovery of coal near what is modern day Issaquah, a variety of people were “engaged in wordy discussions of the quickest and best way to render the Squak coal mines available,” noted The Seattle Gazette in February 1864. In floated William Perkins, who built a boat, floated and paddled to the mines, and returned with a full load. The 140-mile-long trip via the Duwamish and Black rivers and across Lake Washington and Lake Sammamish and back took him 20 days. Trips up and down the riparian highway eventually became easier as river travelers dredged sand bars and cleared out stumps and overhanging vegetation. But everything changed in 1916, when Lake Washington was connected to Lake Union, which lowered the level of the larger lake by nine feet. This was enough to drop the lake below its historic outlet and the Black River slowly died, with remnants persisting until at least 1969. A photograph shows a narrow swath of shrubs, weeds, and cottonwoods that curved east between North Third and Second Streets toward the intersection of SW Sunset Boulevard and Rainier Avenue South. That last vestige of the Black now lies under the parking lot of a huge Safeway. The other remnant of the river still exist. At its confluence with the Duwamish is the Black River Riparian Forest. Not the most beautiful of spots but following years of restoration, visitors have reported over 50 species including salmon, coyotes, salamanders, and bald eagles. The area also supports the largest heron rookery in the region. How did the lowering of the lake affect the level of the slough? You said that boats would go through it with coal to Lake Sammamish but that seems near impossible today as it is barely navigable by canoe. I imagine it too was much higher. Did Lake Sammamish drop in water level with the opening of the Montlake cut? That’s a good question without a good answer. We don’t really know how much Lake Sammamish dropped when Lake Washington was lowered. I know that this sounds strange but there are no widely accepted pre-1916 levels for L.S. Depending upon which map source you use, the lake was 3 to 10 feet higher before the locks opened. A friend of mine who I feel has looked at this more closely than most people thinks the drop was on the order of 2 to 3 feet. Regarding what the Slough/Sammamish River was like post-1916 is problematic too. What I do know is that prior to 1916 the Slough/SR was navigable but during flood stages there really was no main channel as the water spread across the valley. Not sure if this helps or not. Thanks for this info. I just took a tour of the locks with someone who works for the Army Corps of engineers. He made it sound like the Black River was intentionally done away with instead of a consequence of lowering the level of Lake Washington. The Cedar River had to be routed into Lake Washington so there was enough inflow of water to maintain the level of the lake.Lake Washington is maintained within a two foot band, without the water coming frI’m the Cedar River that would not be possible.